Finding Dory is the long anticipated sequel to Finding Nemo and kids of all ages have been eagerly anticipated seeing it. But this movie may not be appropriate for all children due to emotions that it may trigger. For some families a trip to the theater to see Finding Dory may not be a fun trip to the theater. It has already been said that this movie is not a good movie for families who have foster children or children who have been adopted but I am going to take it a step further and say that it may affect other children as well. Why is that you may wonder? WARNING! Before seeing Finding Dory, all foster/adoptive parents should preview the movie first! We thought our teenage bio kids & 9 yr.-old adopted son (we've had him for 4+ yrs) could see it without us previewing it. Our kids sat in the row in front of us. Halfway through the movie, our 100 lb., very tall son, got up and came and sat on my lap for the duration of the movie. Dory has childhood flashbacks throughout the movie as she seeks to find her birth parents. The movie deals with multiple levels of abandonment and loss. While the ending is sweet as she is reunited with her birth parents & we realize her birth parents were looking for her too, there are elements of the ending that can have detrimental results for our adopted kids. 1) It was Dory's forgetfulness that caused her to be separated from her parents.... basically, her separation was her fault. My thoughts: Many children who are in foster care or who have been adopted may see this as saying it is their fault they are not with the biological parents. I would take it a step further and say that this may even be a trigger for kids whose parents are divorced and have an absentee parent due to the divorce or for kids who are being raised by family members who are not their biological parents. It is in the nature of kids to internalize this blame to begin with, so to have a movie that shows that it was the character's fault she is not with her parents can reinforce this false belief. 2) Her birth parents were physically, emotionally, & mentally stable and ACTIVELY seeking for her. This is not the case for MOST of our tender-hearted kiddos. This birth parent 'fairytale image' can create a false image in their forming minds. My thoughts: In the case of foster children where the children were removed from the home the birth parents were found that they were not capable at the time of being able to care for the children in the home. Some families whose biological children may be working with authorities to have their children returned to their home and reunification may be possible. In some cases however, the birth parents are not capable of caring for their child and are not actively working to regain custody of their children. This movie may give the idea to kids that their birth parents want reunification with them as much as they want it but in many cases this is not true. My oldest son and daughter are not biologically mine. My husband had full custody of them when I met him. They were the tender ages of 9 months old and 4 years old. They have always lived with us, and there was an 11 year time period where they did not see her biological mom. During that time she was living just an hour from us, knew where we lived, and still made no effort to see the kids. My son began to see my husband and I as the reason that his biological mom was not in his life and he put the blame on us, acting out in many ways. He has just now began to see this is not the case, but during that time period it made for a very difficult time for us. This movie may trigger these feelings or reinforce these feelings in some children. 3) At the end of the movie, once Dory, Marlin & Nemo find Dory's birth parents, they ALL (including the birth parents) travel back together to Dory & Nemo's home and all live TOGETHER Happily Ever After. Some young foster/adopted kids might think that is the end goal. My thoughts: This may actually be the end goal for some families but for others this will never be possible. 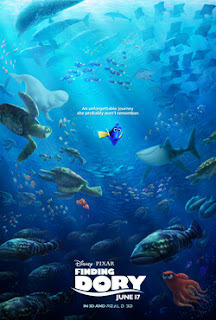 I think it is a positive however that this movie does show how Nemo and Marlin support Dory in her search for her adoptive family and that just because she wants to find her birth parents it does not mean that she does not still want or need Nemo and Marlin. I think this is a very important thing and can show the search for adoptive parents in a positive light. I think this can also show children of divorced families that it is okay that they love both parents and that they do not have to chose between one parent or another. So, bottom line... preview the movie first & evaluate for each child. There are some heavy topics brought up in the movie that are difficult for every foster/adopted child to deal with even at older ages, so don't think this cute Disney movie is for everyone. While this movie may bring up many negative feelings in some children, feelings of abandonment, self-doubt, and blame for an absentee parent, it can also be used as a tool to discuss these feelings. I think the best way to approach this movie for families who have children who may be triggered by the feelings that this movie brings up is to watch the movie at home instead of a movie theater. As the children react to the movie or as difficult parts arise you can then stop the movie and immediately discuss these topics with your children. As with any movie, it is important to remember that you are the one that knows your child best and will be the best person to judge how your child may react to a movie.